For other places with the same name, see Piorunów. 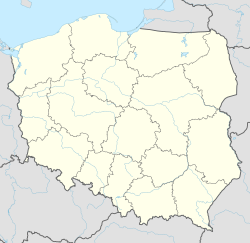 Piorunów [pjɔˈrunuf] is a village in the administrative district of Gmina Błonie, within Warsaw West County, Masovian Voivodeship, in east-central Poland. It lies approximately 4 kilometres (2 mi) west of Błonie, 16 km (10 mi) west of Ożarów Mazowiecki, and 30 km (19 mi) west of Warsaw. ^ "Central Statistical Office (GUS) – TERYT (National Register of Territorial Land Apportionment Journal)" (in Polish). 2008-06-01. This Warsaw West County location article is a stub. You can help Wikipedia by expanding it. This page was last edited on 28 March 2017, at 22:43 (UTC).